Power to the water ! On these pages we will explore and dissect the many crucial parts in getting the power generated by the prime mover ie: diesel engine - to do work. Check out the many different setups which have evolve to achieve this, by visiting this page. Learn about the prime movers - steam, diesel engine, gas turbines. We start at the flywheel, and work our way back to the propeller. We can find clutches on most ships with four stroke medium speed / high speed engines used for propulsion. The larger two stroke engines can rotate at much lower speeds, 50 - 110 rpm, and are therefore directly coupled to the propeller shaft. Medium speed engines rotate at ~300-900 rpm, and high speed, 900 + rpms. These speeds are to fast for the complete and efficient transformation of rotational energy into thrust. Therefore these engines have a reduction gearbox, aka redgear. A gearbox is connected to the prime mover by way of a clutch; an on / off switch if you will. The clutch allows the engine to run without having to turn the propeller and shafting. Without a clutch all that inertial load would require a monstrous starter, or mass amounts of air to start the engine - a waste financially and mechanically. In a ship with one propeller shaft and two (or three, four etc) engines, the clutch give flexibility in operation. The shaft can be run on one engine or two depending on demand, or as matter of redundancy such as on a rig "stand by" vessel. The purpose of a clutch is to connect the propeller to the engine. A clutch needs to handle large amount of torque with minimal heat and mechanical losses. They should react quickly and not absorb to much power to achieve their goal (heat and mechanical losses). 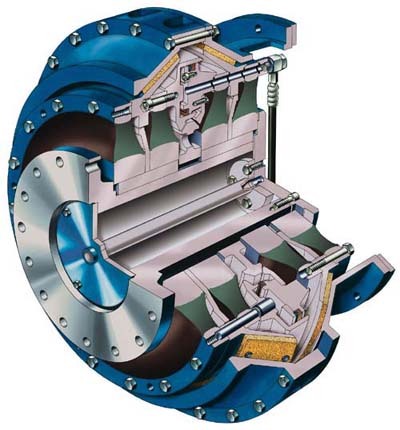 The most common are friction clutches. They operate on the principle of two surfaces having enough friction to stick together and not slip. The two most common types are the cone clutch, and the "plate" or "clutch pack". On Canada's west coast, some BC Ferries vessels have a pneumatic operated cone clutches like the Lohmmann + Stolterfoht pictured on the right. Once actuated, compressed air is led into the piston space, moving the friction cones, axially, into contact with the friction surfaces driven by the engine. Given enough pressure, the two friction surfaces become one rotating mass, transferring torque from the engine to the gear. With this particular clutch we see four rubber elements; in transmitting power from the "cones" to the output shaft, these elements dampen torsional vibrations and allow for slight misalignments. On smaller to medium size installations the clutch is usually built within the gearbox. Below is a cut away example of a typical clutch pack. One plate is anchored into the drive cup (engine), one plate is anchored into the output shaft. On the illustration we see that this clutch pack is made up of six sets of plates. When these are pressed together by the oil pressure acting on the piston area and the backplate, the plates become one turning mass. If the ship is not equipped with a controllable pitch propeller (CPP), a gearbox will have two clutch packs, one for reverse, one forward within the same gearbox (see diagram below). Hydraulic oil pressure is developed by a gear pump on the input side of the gear and is controlled by a simple spool type hydraulic valve. The valve has three positions which will allow oil to act on one of the clutches, forward or reverse, or none, giving us "neutral". Some ships utilize a hydraulic coupling. They operate much like the torque converter in your car�s automatic transmission. Within the housing, the two halves have many chambers, like a sea shell cut in half. One half, the "driving impeller", is driven by the engine. The other, the "runner", drives the output shaft - into the gearbox. Because of the inertia from the rotation of the impeller and the curvature of its chambers, the oil sets up a swirling action or "circulating vortex". The circulating vortex impinges on the runner, where it is captured by the runner's curved chambers and therefore creates resistance. Over a short time, depending on the "health" of your coupling, a vortex of oil swirl in each set of chambers, hydraulically locking the impeller and runner. Since axial thrust is develop within the chambers the unit is fitted with thrust bearings. These types of couplings built up heat which must be dissipated by heat exchangers cooled by water, reducing somewhat their efficiency. Since there is no mechanical connection, these couplings are able to absorb small shock loads, which can be detrimental to engines. On both the hydraulic operated clutch packs, and the fluid coupling, oil maintenance can become major problems if not attended to. On clutch packs, low oil, no oil will result in insufficient pressure and therefore slip. This slipping will build up heat, and quickly eat up the friction material sometimes made up of sintered bronze. If oil analysis is not performed regularly, the bronze will show up as shiny suspended solids in the oil. Cooling system, heat exchangers, piping can be a source of oil contamination and or leaks and should be checked regularly. Slip clutches... you can find out about these by clicking here. Onward, to the gear boxes!